I’ve noticed a growing trend of people having Icelandic magical staves tattooed on them lately. Some of the choices, alas, range from weird to unintentionally funny and inappropriate. On its own having such a stave tattooed is not a bad thing at all. Icelanders themselves often get them as tattoos and it’s not considered insulting if a foreigner does the same, but there are dangers there that you’re well to be aware of. The most important one might be that just because a culture is Western does not make adapting its symbols any safer than getting a tattoo in f.ex. hanzi/kanji. To avoid embarrassing mistakes you’ll have to do your research first, and for the love of everything do not trust any chart that you see at a tattooist or floating around online, especially if they describe the meaning of the stave in only one or two words! One such example can be found here, a picture that’s been going around Tumblr for a while now and unfortunately seems popular. The irony behind is that the person who put the chart together did it precisely to warn people against getting the wrong kind of a tattoo (source), and many of the staves on that picture are examples of that. Some won’t work alone, such as Gapaldur and Ginfaxi. They have to be present at the same time to have any effect at all but that’s not enough, they also have a specified location. Gapaldur has to be placed under the heel of the right foot, and Ginfaxi goes under the toes of the left one. Worn in this manner they will ensure their bearer victory in battle! That’s if you’re a pro wrestler. Gapaldur and Ginfaxi are not generic battle staves, they only help in the ancient Icelandic wrestling, Glíma. I’d also like to point out that although good, this person’s list of stave explanations is not exact. The Svefnþorn (= sleep thorn) for example, that’s stated to give restful sleep, is according to the book Huld (= hidden/secret) indeed accurate. The book then adds though that if the staves are not removed there’s a chance that the sleeper will never wake up again, so perhaps it’s a good idea to list these ones as “do not self-medicate”. …and it’s not yet done. You still have to do a small incantation in the end and for those in Ásatrú, note that this incantation may be thought of as being insulting to Óðinn. What about something that sounds really epic, such as the Óttastafur (= fear stave) that’s supposed to strike fear in your enemies? Well… there’s a few reasons why it might be a bad idea. First of all most stave and rune workers agree getting a negative stave such as this one tattooed on you, or even using one, is not smart. What if you draw it wrong? Icelandic staves have a direction to which they have to go or you’ll risk turning the effect of the stave against yourself, meaning that instead of striking fear in your enemies the stave may perhaps make you deadly ill, or paranoid for life, neither of which is probably the warrior-like quality you were after. It may also have a different effect on other people than you wished for: in the sagas the use of attack staves tends to mean that the user is a weakling who would not inspire fear in anyone, thus the need for magic. Besides that creating Óttastafur, like all Icelandic magical staves, is a serious business ritual and not just a fancy scribble. It’s not only place-specific but also material- and usage-specific: to make it work in your favour you’d have to carve it to a shield made of oak and then manage to throw it at your enemy’s feet. These ones protect you from magic. Magically. The staves were drawn for many reasons from preventing barrels to leak, creating the famous necropants (link)(link is safe for work), helping you become a great rower, or to assist you in cutting hay. Yet no matter how strange they now seem to us they were once made for a reason, and for example the cutting hay -stave was seen so important that to make it work it had to be carved to the scythe and then coloured in blood from the main artery of one’s left hand. It’s important to bear in mind that the descriptions on how the staves were to be created were written down by Christian authors, which means that especially the dark magic ones may have some added flair to the creation just to underline how evil they are and/or confuse a reader who would want to try making one, thus ensuring they’ll make a mistake in creating the stave. However, since many staves were considered perfectly acceptable the authors have had no particular motive to colour their making further. It’s also good to remember the time in which they were created, and that certain things such as oaken shields were perhaps a little more common then than today. Some things like strengthening a stave with blood will also seem a lot more dramatic to us than to the people back then: Egill Skalla-Grímsson himself drew runes/staves on the side of a drink he suspected poisonous and filled them with his blood, and all this in the middle of a party. But does any of the above really matter if you’d just like a stave for decoration and don’t particularly believe in Icelandic magic? Tattoos are taken for one’s own self first and foremost after all, some may even be in places you would rarely show to another human being. The answer to this is maybe and maybe not, it entirely depends on why you’re getting that tattoo. If you’re following any religion you may want to see that they don’t go against it. If you believe in magic be doubly careful. If your motive is that you like to study the staves or runes you might also want to wait for a few months and read up on your choices, maybe ask a specialist before getting inked, because getting the wrong kind of a stave or a misspelled piece of runic text tattooed on you will be your eternal reminder of getting that tattoo before you had earned it. Still, there are some staves that are positive in their effect and therefore safe choices so why not pick one of those? The Vegvísir (= route shower) will help you find your way to your destination no matter what. It’s a popular protective tattoo; Björk, for example, has a vegvísir tattooed on her. Ægishjálmur (= helm of awe/terror) is also considered void of negative effects to the bearer despite its name. I’ve come across translations such as “making you irresistible” and while correct, it only grants you one kind irresistibility – it’s worn to inspire awe and fear in people who oppose you and simultaneously keep you safe from your own higher-ups using their position to abuse you. The difference between ægishjálmur and óttastafur is in their basic use: while óttastafur is meant to be used as a weapon, ægishjálmur, like its name suggests, is meant for defense and protection. If you’re interested in the subject there are some original Icelandic books on magical staves available on the net such as Huld (here) and Galdrakver (here). I also found a really interesting article about ægishjálmur here. Source of the images used in this entry here, the rest of the images belong to me. Ástarsaga úr fjöllunum (link). Lyrics here, English translation available. Ölduslóð (link). You can find the lyrics to this and the next song here. English translations available. Maybe you could help me with some additional information. I would like to get a tattoo on my chest. I first thought of doing Ægishjálmur but wonder if Veldismagn would not be more accurate to get on. I looked up Veldismagn just in case and since it’s one of those protecting (rather than attacking) staves it should be fine. It’s more specific about how it should be made than Ægishjálmur, but chest is the correct place, and indeed Veldismagn should be coloured in with the blood of the wearer – so I don’t see why not! @hulda Hi there. I was hoping to find more information on the Veldismagn, but I am not sure where to look. I checked for it in Galdrabok, and didn’t find it. Where did you find more information on it? There’s also Galdraskræða, but I’m not sure of whether it’s actually been translated to English yet. I wanted to tattoo myself with some staves, I wanted to tattoo on each side of my chest, on the right the Ægishjálmur’s and in the left Veldismagn! Can I use both staves? @Johan A good place to start is with the futhark. @Johan any extra info you have on the svefenthorn and the gapaldur would be great. I’ve been searching the Internet for info on the svefenthorn.but can find virtually nothing. you’re article was the most informative I’ve found. This is older,it is from 500th century. Do you maybe have translations of the books somewhere somehow? I find this very interesting because i just started learning myself handpoking tattooing. I’m very interested in the old ways of tattooing and the special and magical tattoos of old tribes. However i seem to not be able to find information about my old culture (the old belgians) and stumbling across your post makes me eager to try out some things like that. Do you think it would be an okay idea to get into runes and magical staves and other signing to more or less specialise in? @hulda So, would you say that if i buy 1 of the books about the staves, that i have all the information i need to start tattooing? I don’t want to evoke some evil stuff or anything. Another question is, i would like to do the Gapaldur & Ginfaxi on my own feet. But i’m not certain about Ginfaxi; should this be on the toes or on the ball of the foot? Does every stave have a certain way the lines must be drawn in order to “work” or not cast anything negative? Can i email you for more questions if i have some? Gapaldur and Ginfaxi, the wrestling runes, were not to be tattooed at all but drawn on pieces of paper or leather and slipped into the shoes of the contestant. 🙂 Not ever stave has a certain way the lines must be drawn but some do, at least according to Egils Saga where badly drawn love magic ended up almost killing the girl the admirer was trying to woo by magical means. I can be contacted at the blog’s e-mail icelandinmymind at gmail dot com, but alas I’m not very knowledgeable on runes and staves – I only lean onto basics and the few sources that I’ve managed to find. I hope you’ll be able to find someone with more experience on working with them though! hey, i was thinking about vegvisir for a tattoo, and even though the original in the huld manuscript does not contain one, i was wondering if a circle going around the intersection of the staves would still make the staves useful? This is a good site about the symbol too if anyone needs..
@Joseph Excellent sources! Anyone interested in learning more about the staves and runes, I do recommend these as well. Thank you for the links! First of all, wanted to tell you that I absolutely loved this entry and found it very interesting. I have wanted an Icelandic rune / charm tattoo for quite a while and I was considering which one I was more fond of. During a recent trip to Iceland, I discovered a couple of staves and runes that I didn’t know about and that I absolutely loved when it comes to the look of them. I tried to find information about them to see if I agreed with the meaning, but all I could find is that they are love-related. However, I can’t seem to find more information about them and now I’m not sure if they’re part of the Icelandic stave and rune culture or if it’s something added later on. I was hoping you could help me out and point me in the right direction? I do love the looks of them, but I wouldn’t want to have something on me forever that turned out to be a fiasco. @Miren Having seen even the Icelandic museum of Witchcraft sell items with ástarstafur printed on them I wager a guess it’s a safe one to use! Note though that its purpose seems to be keeping up already existing love, not bringing about a new one. If I’m going to get a tattoo of the Ægishjálmur, is there any more benefits of power or protection to get one adorned with all the runes of the Futhark? Is there any issue negative issues with getting it tattooed on your arm? @Anthony Corriero The classic placement for ægishjálmur is the forehead but I daresay its strength will be the same no matter where it’s placed. It’s a benevolent stave with no known negative effects and one of the strongest protective ones, so I’d say go for it! If someone were to get Veldismagn tattooed on their arm, would it have no significance? Just to clarify earlier comments, yes that vegvíser you have is a badly drawn/rendered copy not found in any manuscript. Ægishjálmur can be placed on the forehead, but this symbol has many designs and many different instructions depending on which manuscript you find it in. Even its meaning changes somewhat between versions. The Veldismagn also has different designs although they appear more consistent across manuscripts. The manuscripts tend to favour a wide version not commonly seen. Putting runes around any stave has no affect. Some recent artist thought it looked good to put a runic alphabet 1000 years out of time and from a different country around a vegvísir, and its been ridiculously copied ever since. You can get accurately researched information on my web page. Thank you for the link and the very informative and interesting comment! Great page and awesome job you’ve done Justin! I learned so much from your site when I was researching for myself awhile back! Thank you! Loved your article! I am an an Asatrar and I study runes and symbols as part of my faith. I am currently thinking of getting a tattoo of Ægishjálmur on my forearm. I have heard conflicting reports as to whether or not Ægishjálmur and Vegvísir should be gotten together. What is your take on that? @Paige Personally I see no problem combining the two and have seen it done several times here in Iceland, both staves are meant for protection after all. Still, I’m not an authority in stave matters so if someone offers a good reason not to it’s definitely worth considering. @Brandon Alas, I don’t have any ideas for actual tattoo designs and with those it’s always good to ask a professional. The comments section here has lots of wonderful information and links to research material though! Great article. I am looking into getting a Vegvísir tattoo (thinking on my upper back, between the shoulder blades or at the base of my neck?). Because I understand that in Viking times, the Vegvísir was drawn on with blood, I’m wondering if it would be in bad taste/disrupt the power of the stave to have tattooed some kind of “smear” of red to symbolize blood in the background of the rune? Or perhaps encircling it? Would love to hear your thoughts. I stumbled across your blog and I have a question about tattos, you might be able to answer it. Me and my boyfriend would like to get a rune tattoo on the wrist – Mannaz for me (from the Anglo-Saxon futhorc – I’m an Anglo-Saxonist, by the way, but not versed in the magical meaning of runes, just their linguistic meaning; anyway, it’s important for me), and Jera for him (from the Norse futhark – after some research, he likes its cycle meaning). Is there anything I should be warned against about it, or is it safe? @hulda From what I’ve studied, both Mannaz and Jera have relatively few negative side effects when it comes to tattoos. About the only ones I would be careful with is Hagalaz or Thurisaz. Hi, was wondering if there were any symbols that represented love. The man in my life and I are really wanting matching tattoos. And was wondering if there were any out there that would possibly suit that end? @Emily Goad The staves are not symbols, they’re tools for magic and as such love inducing staves have been considered as an attempt to cause someone grievous harm, since the idea was that love should always come to a person freely and not be forced on them by magical means. I’ve recently discussed this topic with someone who’s studied staves much longer than I have and his idea was that it would be best to avoid love staves altogether, even the ones sold for tourists. At their origin they weren’t even meant for romantic love, their purpose was to magically coerce a girl to sleep with someone, even if that was against her will. I founded this post very interesting, thank you for it! I have a question, i’ve seen in the museum’s online shop that they have the Galdrakver. Do you know if there is an english translation of the Galdrabok? I can’t found it. @Enrique Alas, not that I know of… if someone in the comments knows more about possible English translation please let us know! I think people can get out of runes whatever they choose to, and the popularity of “esoteric runology” pays testimony to that. Many “rune writers” attach a whole range of meanings to Futhorc and Futhark runes, most of which they personally “devined”. The only meaning I can comfortably attach to known runes comes directly from the rune poems written in the late middle ages. That said, to answer Manon directly, there is no Jera in Norse runes. Jera is the name for the J rune, and the sound for “j” dropped out of use in Scandinavia. Alphabetically “j” was incorporated into “i”, however in the rune row “Jera” became “Ár” which means “Plenty: a boon to men and good summer and thriving crops”. To my mind, getting an Ár rune would be very safe and would be forever inspirational. Wikipedia can give more on the history of Jera/Ár. What a wonderful blog! I’ve been wearing Iceland runic T-shirts for years bought from the Nordic online store. I’ve got to replace my Ægishjálmur T shirt which is falling to pieces. Thinking of also getting a Veldismagn T shirt. Not sure yet. They are all very powerful. I’m thinking that Iceland (Island) must be the only country with a national Witchcraft and Sorcery Museum… Well done Island! @Philip Iceland has a museum for anything and everything! 😀 Good luck with your search! As a tattoo, is this something that would be offensive/not advisable? @Jessica This web page is reliable in my opinion. The page taken from Huld manuscript does read as if the second design is a vegvísir, NOT a lukkustafur. The left bottom side however is titled as “lukkustafir”. Lukkustafir, according to Huld, is not a stave to give its bearer good luck but one to protect its owner from bad luck. Small but important difference! I am thinking about getting a vegvisir tattoo on my right hand and was wondering if it is ok to hade it there or should it be placed somewhere en se to be effective? Hi There! Maybe you can hep me. I’m considering to make a Vegvisir tattoo, because I’m a great admirer of iceland’s history and culture, and also because I love what it means and I think it would look good on my arm. But I’d like to know if it would be some offensive form of apropriation or anything like that to have this tattoo and not being iceleder or nordic at all. @Carmen No, none at all! A good rule to find out if having something is cultural appropriation is to look at how freely the people of said culture would hand it to outsiders. Vegvísir is a common design used for, well, almost anything and it’s a popular decorative element in various souvenirs too. I’d say go ahead! First of all i want to tell you that this is great information for every foreigner who feels fascinated for your culture. I want to get a tattoo related to them. So i’ve been reading a lot about norse symbols, and of all of them i really like Vegsvisir, the only problem is that (according to what i found) it’s a kind of modern symbol and part of the neopaganism. To be honest i would like an old norse symbol and i really care about not been disrespectful at all. Do you recomend me to better get a rune instead? or do you know if my information on vegsvisir is wrong? @Nicolás All the staves are younger than runes, so if you want something Medieval/viking era runes are a better option. However, runes are also part of neopaganism so if for example your religion bans such symbols it may be better to go for something else instead. I came across runes just recently.I wrote the symbols for ansuz gebo and wunjo on my ring finger. It helped so much during my break up. I am planning on using henna on my hands and drawing different runes bur now that i’ve come across these warnings i’m not sure. I do want henna runes on my hands. What would you recommend for someone in transition with every part of her life hanging in delay n the future blurry? Hi, I’m thinking about getting the Ægishjalmur as a (warrior)tattoo and wondered about if there’s any special way of drawing it, may it be as a tattoo or any other purpose. I think I read somewhere that you start drawing them from centre and then go on ’till you’ve reached the outer area of the stave, but I’m not sure about that. I would be thankful for some information or advice. @Fenrir Alas, I don’t know much about the exact direction and order the staves need to be drawn… far as I know none of my sources state anything specific about that part. @hulda Sorry, I ought to look here more often. Looking at the way staves were drawn for those spoke+wheel types, there is one certainty to be aware of – each “spoke” is drawn separately and not through the middle. I.E. Ægishjálmur has eight arms, not four lines. Whether there is a direction inward or outward to be used in the drawing of each spoke is not something evident. Although, it would make sense to draw in a particular direction if the purpose is to radiate out or gather in some power. Thanks for the quality of this article, i found it very interesting and it helped a lot understanding the concept of those symbols! Great work :)! As many other readers, the idea of getting tattoed a islandic tattoo comes to my mind, but i want it to be meaningfull more than trendy. I would like to get some more informations about Óttastafur, if it’s an offensive rune and if it would be ok to be tattoed one, and where (to avoid negative impacts on me or my connections). Although, i often came accross these symbols (http://images.google.fr/imgres?imgurl=http%3A%2F%2Fimage.shutterstock.com%2Fz%2Fstock-vector-futhark-norse-runes-set-magic-symbols-used-as-scripted-talismans-for-luck-love-and-protection-390783658.jpg&imgrefurl=http%3A%2F%2Fwww.shutterstock.com%2Fpic-390783658%2Fstock-vector-futhark-norse-runes-set-magic-symbols-used-as-scripted-talismans-for-luck-love-and-protection.html&h=1600&w=1428&tbnid=jJfQvm6NqfmaXM%3A&docid=azhPLvjTgDBd9M&ei=9Zq_V5q5Ise4aoCvnAg&tbm=isch&iact=rc&uact=3&dur=1614&page=0&start=0&ndsp=22&ved=0ahUKEwjah_bR9t3OAhVHnBoKHYAXBwEQMwgcKAAwAA&bih=667&biw=1366), i wanted to know if they were truely norse runes and what is their signification? @Maxime Alas, those don’t look like traditional staves at all, so unless they’ve just been “re-drawn” to look extra pointy I’m going to suggest they’re modern designs. Hey it’s been a while since you posted this but I’ve got a question. I’m thinking of getting a tattoo of a icelandic rune. According to my research it means hope. It isn’t like any of the runes you showed in here. It’s very simple. But the thing I find odd is that it isn’t a popular rune which makes me doubt its reality. I will put a link where you can find it. The only reasonable explanation I found is the icelandic runic alphabet. The word hope translates directly to VON in icelandic and if you put the symbols signed to each of the letters together and onto each other – some of the lines will cover and the outcome is the rune. More or less… I would really appriciate your answer because I don’t want to get something so permanent only to make fool out of myself. It won’t be a big tattoo maybe 1,5 cm. I’ve always wanted a tattoo that means hope because it has a very important place in my life. I found this rune and fell in love with its simplicity and how it can be meaningful to me but mysterious to the rest. I admit I’m not a specialist in this, but those designs you linked me are definitely modern and not actual staves. Staves in fact never mean just one word, so any stave that comes with explanation that it means “love” or “strength” is most likely either named wrong or… just someone’s own idea, I’m afraid. Staves are always meant to do something specific; protect you, attack something, lock something, open locks, create something, power up your tools so that work goes faster and so forth. @hulda More on that VON… that and the other large set of symbols are bind-runes. Bind-runes were commonly used as literary abbreviation device (like we often use an apostrophe to combine and shorten words). Occasionally and rarely used historically, bind-runes were used to form whole words. However, not as we like to use them to form amulet sigils today. So, for that VON bind-rune, VON translated to English is “hope”, so that is correct. Next, within that bind-rune can be found ᚢ, ᚮ and ᚿ (these rune symbols will only render in some browsers). Note that the ᚢ rune usually stands for the letter “u” but prior to dotted runes it also stood for the letter “v”. The placement of these runes in the bind-rune is arbitrary and would not be my first choice (largely because it initially appears to use two ᛏ runes). The same can be said of the large table of many bind-runes. Placement of the runes is arbitrary so figuring them out is difficult. My recommendation is to have someone custom design your bind-rune so they can explain how it has been done and you can decide if you feel good about it, or else study runes and design it yourself. Hi ! I really loved your article.I am completely in love with Pagan culture the history of the Nordic peoples and the civilizations that could inherit this culture Like your country For a long time I have been falling in love with runes and I know that the best ones for tattooing are those that have properly Are those that have a proper protection function. Veldismagn . So, do you think there would be a problem? 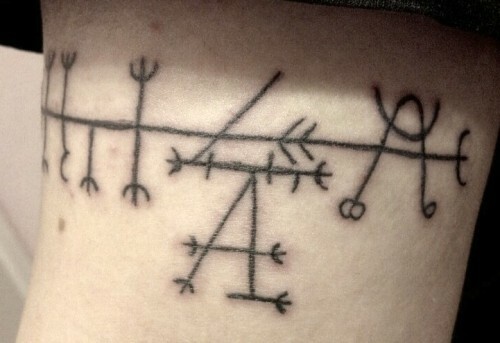 My son wants to have “January” tattooed in Futhark Runes, is this a bad idea as far as having those specific Runes tattooed on him? Hi! Very interesting and informative post, thank you! 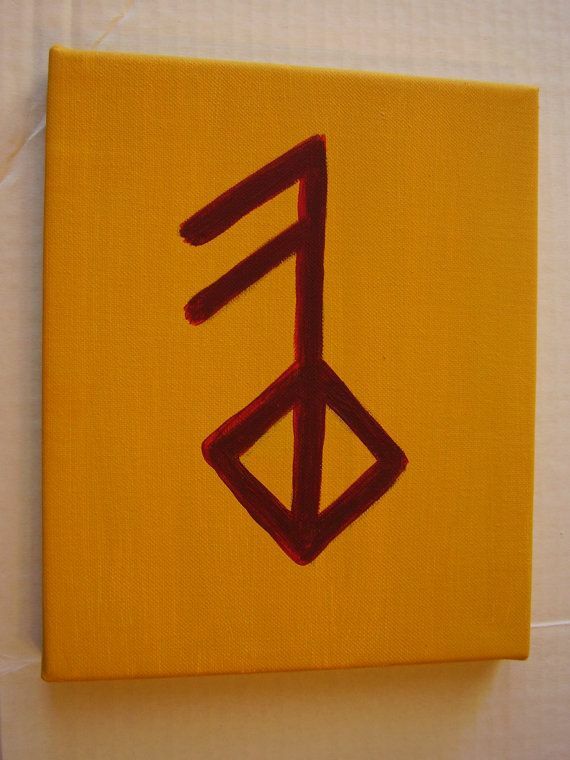 I am thinking about getting a runic tattoo, possibly the mannaz rune on my wrist. I like its meaning, both literal and “metaphorical”, and my family comes from Germany so I thought, considering that mannaz is from the elder futhark, it would also have some sort of reminder of roots kind of meaning. Is it ok to get a rune tattooed? Is there some sort of precaution one should have? Hi, I was just wondering for what was exactly used the hulinhjálmur, and what could it does as a tattoo. Hi, I was wondering also about the draumstafir. It’s necesary the four symbols to work? What was it for exactly? Could you help me please. I was thinking about getting a vegvisir and Egishjalmer (sorry about the spelling) on the inside of my wrists one on each side. Would this be ok or should they be place somewhere else? I would like to ask for a little help in the topic, i want to get the vegvisir as a tattoo, i wanted to know if is something you suggest, and where to get it, cause i was thinking of my shoulder but im not really sure. Hi, I was wondering on your opinion of getting ginfaxi and gapaldur tattoo In the correct places on my feet. I wrestle as a hobby and would love to get these done, however, someone else has told me that getting them done as a tattoo is a bad idea from a magical point of view as they can invoke negative reactions?. What’s your opinion? I am so glad I found this! I have been researching more and have felt a bit lost with all of the information out there via books & internet. I am mid process of making paintings for myself and my best friend and wanted to see what your thoughts/input are on which stave you feel would be more appropriate to paint as the focal point. I have been looking at Vegvisir, Aegishjalmar & Veldismagn trying to determine which one would be more appropriate and used in the proper way. Any input or direction you have is so very much appreciated!